The future is bright for Davidson. 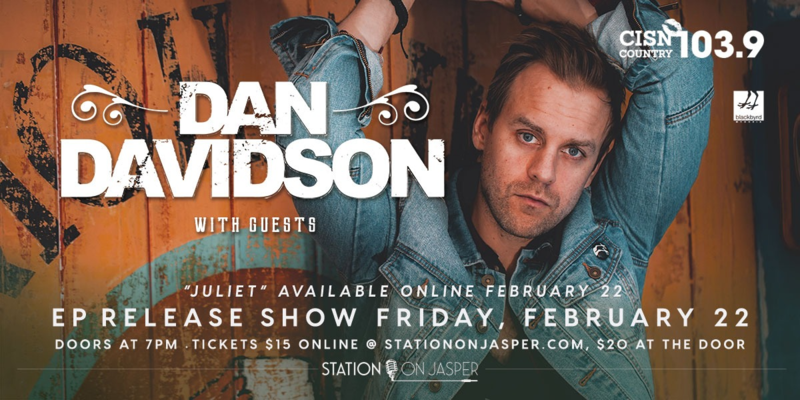 In only 2 years of being involved in the country music scene, he was nominated for 2 CCMA awards (Songwriter and Rising Star), his name can be seen on the charts next to some of the top artists in North America – and he has found a way to do it independently. Dan is new to the country scene, but is far from “green” in the music industry. He spent 10 years playing in the well-known Canadian indie rock band Tupelo Honey (who had several top 40 hits, top selling iTunes records and toured with bands like Bon Jovi). In 2017, Dan won 4 ACMA awards at his first time participating in the event. He took home “Song Of The Year”, “Single Of The Year”, “Video Of The Year”, and “Rising Star”. Recently, Dan has been recognized as a 2-time CCMA Award nominee alongside acts like Dean Brody, Brett Kissel, and other top artists. He also won for MORE ACMA’s in 2018 for “Single Of The Year”, “Song Of The Year”, “Male Artist Of The Year”, and “Fans Choice”. Dan has shared the stage with Jon Pardi, Brett Kissel, Tim Hicks, Chad Brownlee, Gord Bamford, Corb Lund, The Road Hammers and so many more. In 2018 he toured with Brett Kissel on his nearly sold out “We Were That Song” tour.